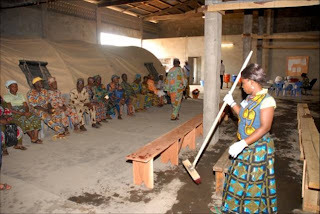 "Who practices hospitality entertains God himself"
Approximately two blocks from the port of Cotonou, where the Africa Mercy is currently docked, is a warehouse. Since the early months from when we arrived in Benin, it has undergone a tremendous transformation. Now it is our Hospitality Centre (HC), it functions primarily as a non-medical, temporary housing unit for pre-and-post-op patients and their caregivers. It consists of two air-conditioned wards with room for 76 beds, as well as bathroom facilities containing showers and flushing toilets! The center also houses the Dockside OP Eye and Physical Therapy Units. 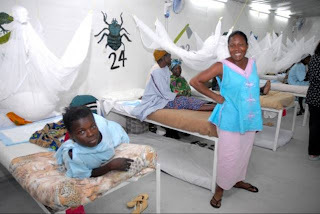 Once patients have been screened and approved, they are generally admitted onto the ship the day before their surgery. However, sometimes patients are not strong enough or healthy enough to undergo a complex medical procedure. If this is the case, patients are admitted to the Hospitality Centre to stay until deemed fit for surgery. During this time, they will be given three healthy meals a day, clean drinking water, and a comfortable bed – complete with a mosquito net. Likewise, once patients are stabilized after surgery and no longer need immediate care, they are moved to the Hospitality Center. They are able to return to the ship for daily or weekly treatment and follow-ups. Mercy Ships provides the transportation – a ship vehicle fitted with a light and siren and with sufficient space to carry a stretcher and five seated patients. It is on constant standby in case of an emergency. 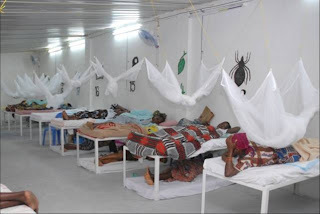 The major benefit of the Hospitality Center is that the beds in the ship’s hospital wards become available more quickly. This means that surgeons can perform more surgeries – and, ultimately, more people are helped. In other words, our impact is greatly increased! 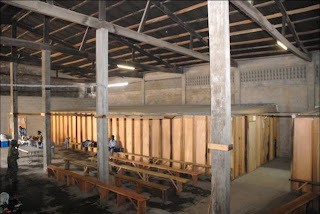 To construct the warehouse to its current state, walls were erected, roofs were constructed, and plumbing for bathrooms and toilets was installed. To make the area secure, a fence with security gates was put up around the property. Electrical wiring was laid for lights and air-conditioning. Because of regular power cuts in Cotonou, it was imperative to install a generator as a backup power supply. All this was achieved with the combined help of the Electrical and Construction Departments of the Africa Mercy, as well as the hard work of Mercy Teams that come from churches all around the world to work with the Ship for a few weeks. Everyday running involves the management of 8 day volunteers, 4 generator operators, and 4 security guards, as well as the coordination of patients and supplies to and from the ship. Teaching on basic nursing skills, as well as the overall care of the patients is also given to our day volunteers. This is a relatively new concept for Mercy Ships and so far it seems to be working well. The Hospitality Centre has already proved its effectiveness by accommodating women suffering with VVF who travelled from the north of Benin. Their recovery involves bed rest and before would take a bed up in the ward for 1-2 weeks. Also, little babies gain weight on a feeding program before they undergo corrective surgery, for example, a cleft lip. The Hospitality Center is already proving to be a valuable tool in delivering hope and healing to the world’s poor, and, if possible, will be implemented in future fields of service.